Posted April 2, 2019 by Seán Kinane & filed under Labor, News and Public Affairs. Custodians in Hillsborough County Schools are fighting back against a proposal to privatize cleaning services. They are rallying Tuesday afternoon outside the school board meeting in downtown Tampa and speaking out during the meeting itself. 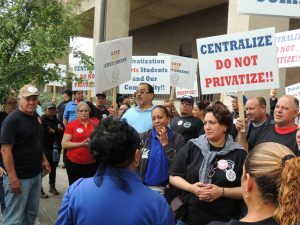 In a separate demonstration Tuesday morning about fifty custodians and their allies rallied in a light rain shower. Organizers say 300 people demonstrated earlier. The custodians are represented by the Hillsborough Schools Employees Federation. 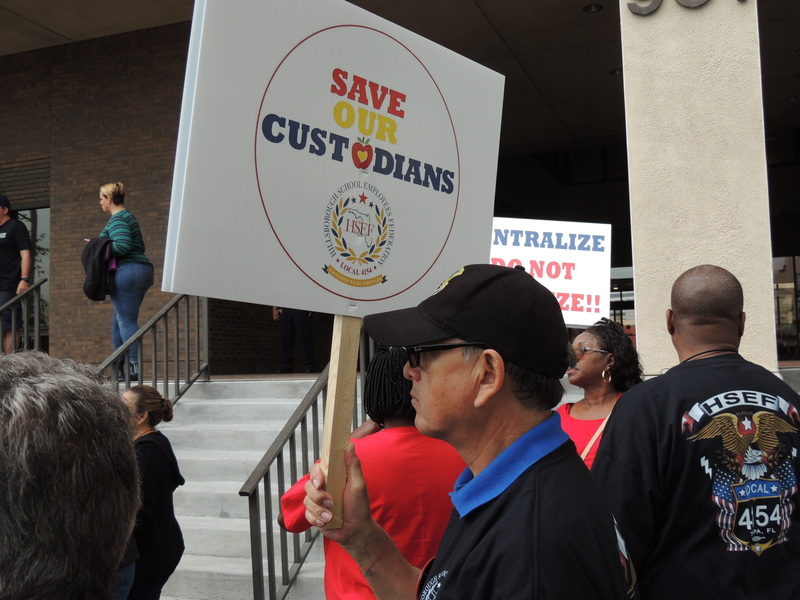 Custodians in Hillsborough County Schools protest against a proposal to privatize cleaning services. By Seán Kinane / WMNF News (2 April 2019). Plant City High School custodian James Bryant told WMNF he worries that privatization means he’ll lose his job right before retirement. So, that means you might be out of a job if they do that? What about the services that’ll be provided — are private contractors as good as workers who are in the union and have been long-time employees? What about for the safety of the kids? What do you think about how that would affect the safety of the children? Stephanie Baxter-Jenkins is executive director of the Hillsborough Classroom Teachers Association. She represents teachers, not custodians, but still thinks it’s better for teachers if the district does not privatize custodial services. Baxter-Jenkins says in other districts that have privatized custodial work classroom teachers have had to take up some of the cleaning duties.